Netflix has been able to provide fans of their service with a fair quality when it would come to horror films in the past few years. Films such as Hush, Gerald's Game, The Babysitter and even series like Stranger Things are keeping us coming back for more. As for their latest attempt in the genre, The Open House, most of them have been disappointed and provided differing opinions to what the aforementioned offerings have brought their subscribers. In The Open House, written and directed by both Matt Angel and Suzanne Coote, we come across the tragic story of the Wallace family who have lost their Patriarch in an unfortunate incident. 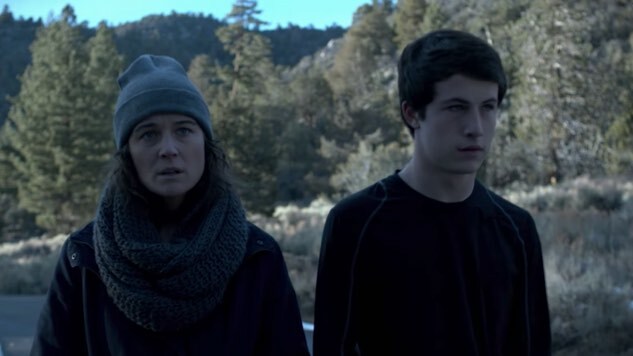 As they are broke and unable to find a means of employment, Logan and his mother are forced to take advantage of an offer to use a family member's mountain home for free until they are able to get back on their feet. The only catch? They must vacate the home on Sundays in order to allow the real estate agents to perform an open house. It stars Dylan Minette (Goosebumps, Don't Breath, 13 Reasons why), Piercy Dalton (Who primarily been in a variety of Short films), Sharif Atkins (ER, White Collar, Guardians Of The Galaxy) and Patricia Bethune (True Blood). I will typically give most genre films a chance without a second thought. One thing I will do however is research a bit on a film or subject I'm unfamiliar with of I've heard nothing about it or if it's from a distributor which has brought us nothing but garbage in the past. Figuring Netflix had a great history of providing us with top notch content, I decided to just jump into this one blind. A mistake I will not likely be making again in the future. In a series of bizarre and unexplained incidents, viewers are left with several plot holes to work through, many story issues and goof ups which leave those paying attention to smaller details of the film realizing that the director did not seem to think through a lot of things. For example, in one scene, as Logan is climbing up the stairs, one of the stair boards breaks in half yet in following scenes, said step is walked on several times with no sign of it having been previously damaged or at any point having been repaired physically not in conversation. And this is only one of the many smaller issues you will notice as you progress through the movie. The film seems unable to build any true tension although the scenes are set up in such a way that any casual fan of the genre would be expecting something of a more prominent nature to happen. Unfortunately this is not the case and we're left with the simple fact that nothing remotely freakish comes about until the last twenty minutes and even then there is truly nothing of importance to take away from it next to a few kills which are left of screen to preserve the identity of the killer from being revealed to the audience. Something I did notice however was what they were trying to do with the film which was set up a type of whodunit which you can piece together on your own of you paid attention to some of the seemingly unimportant details the movie was leaving behind but opposed to a film like Saw, they inexplicably leave viewers without the truth of exactly what happened by the time the credits roll. Is there more to it than just a madman going after a family for no reason? Yes there is, but if you aren't able to put the clues together you're going to end up in total disappointment with what is provided to you. Perhaps it could be considered a good attempt at a horror film, but lacks too many things to keep experienced genre fans happy. On that note, and from what I've read around social media, it seems most younger viewers didn't have as much of an issue with the film and have been defending it to those opposing their personal opinions. If you're a fan of mysteries and figure you want to tackle this one to see if your can discover the truth behind what is happening to the Wallace family, then I suggest you go for it. If you're looking for a straight horror film, I suggest you look elsewhere as you won't find it here.